"Soon there will be a time when a man will be reclining on his couch, narrating a hadeeth from me, and he will say, 'Between us and you is the Book of Allaah: what it says is halaal, we take as halaal, and what it says is haraam, we take as haraam.' But listen! Whatever the Messenger of Allaah forbids is like what Allaah forbids." Narrated AbuRafi': The Prophet (peace_be_upon_him) said: Let me not find one of you reclining on his couch when he hears something regarding me which I have commanded or forbidden and saying: We do not know. What we found in Allah's Book we have followed. فَقُلْنَا : يَا رَسُولَ اللَّهِ ، هَلْ مِنْ قَوْمٍ أَعْظَمَ مِنَّا أَجْرًا آمَنَّا بِكَ وَاتَّبَعْنَاكَ ؟ ، قَالَ : " مَا يَمْنَعُكُمْ مِنْ ذَلِكَ وَرَسُولُ اللَّهِ صَلَّى اللَّهُ عَلَيْهِ وَسَلَّمَ بَيْنَ أَظْهُرِكُمْ يَأْتِيَكُمْ بِالْوَحْيِ مِنَ السَّمَاءِ ؟ ! بَلْ قَوْمٌ يَأْتُونَ بَعْدَكُمْ يَأْتِيهُمْ كِتَابٌ بَيْنَ لَوْحَيْنِ فَيُؤْمِنُونَ بِهِ وَيَعْمَلُونَ بِمَا فِيهِ ، أُولَئِكَ أَعْظَمُ مِنْكُمْ أَجْرًا ، أُولَئِكَ أَعْظَمُ مِنْكُمْ أَجْرًا "
There are many narrations with this meaning. They are mentioned by Ibn Abdul Barr in his book: Al-Tamheed, Volume 20. He mentions almost 30 pages regarding this hadith. Narrated by ‘Awf ibn Maalik al-Asja’ee (radhiallahu `anhu) that: “The Prophet (sallalahu `alayhi wa sallam) once looked at the sky and he (sallalahu `alayhi wa sallam) said “This seems to be the time of the raising up of knowledge,” so one of them said: “O Messenger of Allaah, how is it that knowledge will be raised up and we have the Book of Allaah and we read it and we study it and we teach it to our children?” The Prophet (sallalahu `alayhi wa sallam) said: “I used to consider you one of the most knowledgeable people of Ahlul Madinah, didn’t the Jews and Christians have their book with them (yet they deviated due to many of their shortcomings)? The daughter of Harithah bin An-Nu'man said: "I memorized 'Qaf. By the Glorious Qur'an.'" From the mouth of the Messenger of Allah (ﷺ) when he was on the minbar on Friday. Isma`el narrated to us from Ayyoob [as-Sakhtiyane] from 'Amr ibn Salimah ~ wh o said, "We (i.e. the people of Jarm tribe) lived in a place [which was a thoroughfare], and the riders (On another occasion Ismaa (eel used the word 'people' instead of 'riders') would pass by us on their way back home after seeing the Messenger of Allah - so I would go close to them and listen [to their recitation of the Qur' an] until I memorized so much of it. And the reason why Abu Bakr ibn ‘Ayyaash (may Allah have mercy on him) became so angry at the person who recited it that way is because that had distorted both the wording and the meaning of the Qur’an. And this change comes from the Mu’tazilah who refuse to accept that Allah spoke to Moosaa (peace be upon him), or that He spoke to any one of His created beings. meaning: here is an ayah that does not allow for any distortion or warped interpretations. Translator’s Note: Abu Bakr ibn ‘Ayyaash [d. 193 AH] is perhaps more famously known by the name Shu’bah. He was one of the two well-known transmitters of the Qiraa’ah (Qur’anic recitation) of ‘Aasim, i.e. Shu’bah ‘an ‘Aasim. At-Tabari (d. 310 AH) reports. “One would come with a parchment or a scrap of leather with a Qur’an verse on it until there was gathered great store of such.’Uthman adjured them one by one, ‘You heard the Prophet recite this while he dictated it to you?’ They would answer that that was so. 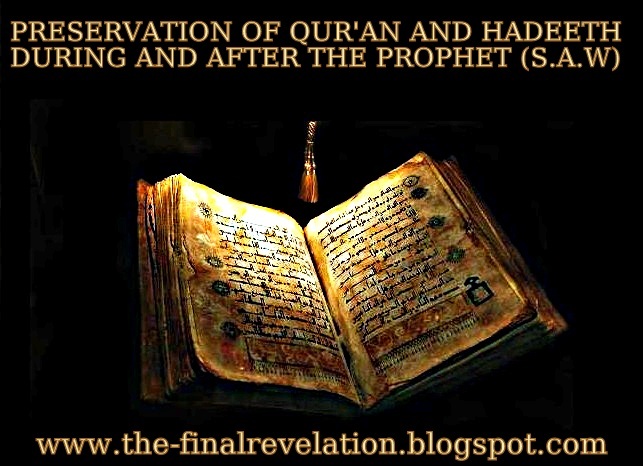 There is evidence that it was not only individually that people wrote the Qur’an in front of the Prophet rather there used to be sessions in which rather large number of people copied and compiled the Qur’anic text in his presence..
Ibn ‘Abbas stated: “The masahif were not sold. A person would come to the Prophet, may the peace and blessings of Allah be upon him, with a parchment and someone would stand and write it for him voluntarily. Then another person would stand up and write until the mushaf was complete. Zaid bin Thabit said: “We were with the Messenger of Allah collecting the Qur’an on pieces of cloth. Narrated ‘Abdullah bin ‘Umar: “Allah’s Messenger forbade the people to travel to a hostile country carrying (copies of) the Quran. Sufyaan ibn Uyaynah narrated to us from [Muhammad ibn Shihaab] az-Zuhree from Anas ibn Maalik who said, "The last glance I cast at Allah's Messenger ~ was on a Monday when he drew aside the curtain [of(A'ishah's apartment] while the people were praying behind Abu Bakr. I [looked at] his face and I saw that it was [as bright as] the page of the Holy Book [ fanadhartu ila wajhihi kannahu waraqatu mushafin] . The people wanted to move [as they thought he was going to join the prayer], but he motioned to them [to attend to their prayer]. Then he drew the curtain, and he passed away towards the end of that very day." Ibn Kathir, in his historical work al-Bidâyah wa al-Nihâyah, mentions that the Prophet (peace be upon him) distributed the prisoners from the Battle of Badr between his Companions (5/191). There are many narrations that have been reported from theSalaf concerning this, and the majority of them are from theIsra’iliyyat which are reported so that they may be examined, and Allah knows best what is the true condition of many of them. Amongst them is that which we can affirm with certainty that it is falsehood, due to its contradicting our sources, and the Qur’an suffices us from the reports of the preceding (nations), because hardly any of them is free from distortion, subtraction, or addition, and because many of them are forgeries. This is because they do not have amongst them the precise Huffadh who eliminate from their narrations the distortions of exaggerators and the forgeries of the falsifiers, like the Imams and scholars, the noble and pious, the righteous and distinguished ones, from the verifying, master scholars and great Huffaz that this Ummah possesses who recorded the Hadiths and verified them, and clarified the Sahih and Hasan from the weak, the rejected and fabricated. They identified the fabricators, the liars, and the unknown narrators, and the other various classes of narrators. All of this was to protect the Station of the Seal of the Messengers and the Chief of Mankind (صلى الله عليه وسلم), so that falsehood not be attributed to him, or that something that is not from him should be reported from him, so may Allah be pleased with them and may He please them, and may he may make the Gardens of al-Firdaws their abode. And truly He has done so. Samurah bin Jundub (May Allah be pleased with him) reported: I was a boy during the lifetime of Messenger of Allah (ﷺ), and used to commit to my memory what he said, but I do not narrate what I preserved [out of respect and caution] because there were among us people who were older [senior] than me. So much so that this was the norm among people, they would first and foremost ask what have you memorized than what have you written? "I said to Al-Hasan bin 'Ali, may Allah be pleased with him: 'What did you memorize from the Messenger of Allah [sallalahu `alayhi wa sallam]?' He said: I memorized from him: 'Leave that which makes you doubt for that which does not make you doubt.'" On the authority of Yahya bin Ayoob from Abu Qubail who narrated from `Abdullaah bin `Amr that he said: We used to be with the Prophet صلى الله عليه وسلم and write whatever he said. 120 - حَدَّثَنَا أَبُو خَيْثَمَةَ ثنا مُحَمَّدُ بْنُ عَبْدِ اللَّهِ الْأَنْصَارِيُّ، حَدَّثَنِي أَبِي، عَنْ ثُمَامَةَ بْنِ عَبْدِ اللَّهِ، قَالَ: " كَانَ أَنَسٌ، يَقُولُ: لِبَنِيهِ: يَا بَنِيَّ قَيِّدُوا الْعِلْمَ بِالْكِتَابِ "
Abu Khaithama narrated to us, saying: Muhammad Ibn 'Abdillaah Al-Ansaaree reported to us, saying: My father  narrated to me from Thumaamah Ibn 'Abdillaah that he said: "Anas (radyAllaahu ‘anhumaa) used to tell his son: 'O my son! Secure knowledge by writing.'" Shaykh Albanee said : He is `Abdullaah Ibn Al-Muthnaa Ibn 'Abdillaah Ibn Anas. He was honest yet made many mistakes. This hadeeth has been reported in marfoo' form as a saying of the Prophet, and it is not authentic. Later, I encountered many paths of narration for the hadeeth reported in marfoo' form, such that it directs towards the fact that it is saheeh. I have clarified this in Al-Ahaadeeth As-Saheehah (no. 2026). Narated By Ash-Sha'bi : Abu Juhaifa said, "I asked Ali, 'Have you got any book (which has been revealed to the Prophet apart from the Qur'an)?' 'Ali replied, 'No, except Allah's Book or the power of understanding which has been bestowed (by Allah) upon a Muslim or what is (written) in this sheet of paper (with me).' Abu Juhaifa said, "I asked, 'What is (written) in this sheet of paper?' Ali replied, it deals with The Diyya (compensation (blood money) paid by the killer to the relatives of the victim), the ransom for the releasing of the captives from the hands of the enemies, and the law that no Muslim should be killed in Qisas (equality in punishment) for the killing of (a disbeliever). Narated By Warrad : (The clerk of Al-Mughira bin Shu'ba) Muawiya wrote to Al-Mughira: "Write to me a narration you have heard from Allah's Apostle." So Al-Mughira wrote to him, "I heard him saying the following after each prayer: 'La ilaha illal-lahu wahdahu la sharika lahu, lahu-l-mulk wa lahuI-hamd, wa huwa 'ala kulli Shai-in qadir.' He also used to forbid idle talk, asking too many questions (in religion), wasting money, preventing what should be given, and asking others for something (except in great need), being undutiful to mothers, and burying one's little daughters (alive)." Narrated Abu Huraira: I said: "O Allah's Apostle! Who will be the luckiest person, who will gain your intercession on the Day of Resurrection?" Allah's Apostle said: O Abu Huraira! "I have thought that none will ask me about it before you as I know your longing for the (learning of) Hadiths.The luckiest person who will have my intercession on the Day of Resurrection will be the one who said sincerely from the bottom of his heart "None has the right to be worshipped but Allah." As al-Khateeb al-Baghdadi noted in his book Taqyeed al-I'ilm, an as I detailed in paper titled Writing of Hadith, Ali (r.a) used to repeatedly tell the people to write down knowledge. These wordings have also been attributed to `ibn Abbas and Anas ibn Maalik and `Abdullah ibn `Amr and have been authenticated by some and weakened by some. Shaykh Al-Albaanee gives a summary strengthening them combining their routes in Silsilah al-Saheeha 2026 and Saheeh al-Jaami` 4434. This hadeeth shows how thetime of fitan in Koofa emerged to such an extent that `Ali radhiallahu `anhu had to openly proclaim so as to impart the AUTHENTIC knowledge. (حديث موقوف) أَخْبَرَنَا أَخْبَرَنَا إِسْمَاعِيل بْنُ أَبَانَ ، حَدَّثَنَا يَعْقُوبُ بْنُ عَبْدِ اللَّهِ الْقُمِّيُّ ، حَدَّثَنَا جَعْفَرُ بْنُ أَبِي الْمُغِيرَةِ ، عَنْ سَعِيدِ بْنِ جُبَيْرٍ ، عَنْ ابْنِ عَبَّاسٍ رَضِيَ اللهُ عَنْهُ ، قَالَ : " تَذَاكَرُوا هَذَا الْحَدِيثَ لَا يَنْفَلِتْ مِنْكُمْ ، فَإِنَّهُ لَيْسَ مِثْلَ الْقُرْآنِ مَجْمُوعٌ مَحْفُوظٌ ، وَإِنَّكُمْ إِنْ لَمْ تَذَاكَرُوا هَذَا الْحَدِيثَ يَنْفَلِتْ مِنْكُمْ ، وَلَا يَقُولَنَّ أَحَدُكُمْ حَدَّثْتُ أَمْسِ فَلَا أُحَدِّثُ الْيَوْمَ ، بَلْ حَدِّثْ أَمْسِ ، وَلْتُحَدِّثْ الْيَوْمَ ، وَلْتُحَدِّثْ غَدًا " . `ibn Abbas (r.a) is reported to have said : "Study the Hadith so it does not get forgotten, as it is not like the Quran which is learnt by heart. If you don't study it, it will slip away from you. Do not say that you have narrated yesterday so you will not narrate today. But say that you have narrated yesterday, you will narrate today and tomorrow as well. " حدثني أبو كثير ، عن أبيه ، قال : أتيت أبا ذر وهو جالس عند الجمرة الوسطى ، وقد اجتمع الناس عليه يستفتونه ، فأتاه رجل ، فوقف عليه ، فقال : ألم ينهك أمير المؤمنين عن الفتيا ؟ فرفع رأسه ، ثم قال : أرقيب أنت علي ، لو وضعتم الصمصامة على هذه -وأشار بيده إلى قفاه- ثم ظننت أني أنفذ كلمة سمعتها من رسول الله -صلى الله عليه وسلم- قبل أن تجيزوا عليّ لأنفذتها . The above narration is said to show how Abu Dharr (r.a) used to keep narrating and teaching the hadeeth firmly. ibn Asakir reported in his Mukhtassar Tarikh Dimashq that Alqama ibn Qays al-Nakha'i (scholar from among the taba'een and pupil of Abd-Allah ibn Mas'ud, died in 62 AH) used to say: Keep narrating the Hadith so it does not get lost. "Look for the knowledge of Hadith and get it written,as I am afraid that religious knowledge will vanish and the religious learned men will pass away (die). Do not accept anything save the Hadiths of the Prophet. Circulate knowledge and teach the ignorant, for knowledge does not vanish except when it is kept secretly (to oneself)." "There were none from the companions of the Messenger - صلى الله عليه و سلم - who had more Hadeeth than me except 'Abdullah ibn 'Amr ibn al 'Aass. For indeed he used to write and I never used to write. "There are none from amongst the companions of the Messenger - صلى الله عليه و سلم - who have more Hadeeth on his authority than me, except 'Abdullah ibn 'Amr ibn al 'Aass, for indeed he used to write while I never used to write." "There was nobody more knowledgeable about the Hadeeth of the Messenger of Allah - صلى الله عليه و سلم - than me, except 'Abdullah ibn 'Amr ibn al 'Aass. He took permission from the Messenger of Allah - صلى الله عليه و سلم - to write what he heard from him, and he gave him permission. So he used to write with his hand and memorize with his heart, while I only used to memorize with my heart." There are many more, umpteen books and hundred thousands of pages that talk about this topic, but i believe this should suffice those who raise objections. 34 See al-Dārimī, ḥadīths no. 485, 487, 493-7; al-Baghdādī, Taqyīd, pp. 49-61; Ibn ῾Abd al-Barr, Jāmi῾ Bayān al-Ilm wa Faḍlih, ed. by Abū al-Ashbāl al-Zuhayrī, 2 vols (Dammam: Dār Ibn al-Jawzī, 1994), ḥadīths no. 335-58; ῾Abd al-Khāliq, p. 427. 35 Al-Baghdādī, Taqyīd, pp. 62-5; Ibn ῾Abd al-Barr, Jāmi῾ Bayān al-῾Ilm, ḥadīths no. 359-62, 371, 373; ῾Abd al-Khāliq, pp. 428-9; Gregor Schoeler, The Oral and the Written in Early Islam, ed. by James E. Montgomery, trans. by Uwe Vagelpohl, Routledge Studies in Middle Eastern Literatures (Abingdon, Routledge, 2006), p. 118. It is, however, reported that some of those who obliterated the ḥadīths they had written regretted that later. See al-Baghdādī, Taqyīd, pp. 64-5. 36 Al-Dārimī, ḥadīths no. 481, 483; al-Baghdādī, Taqyīd, pp. 66-9; Ibn ῾Abd al-Barr, Jāmi῾ Bayān al-῾Ilm, ḥadīth no. 364. 37 Al-Baghdādī, Taqyīd, pp. 67-9; Schoeler, Oral and Written, pp. 117-8. 38 ῾Abd al-Khāliq, p. 429. See also al-Dārimī, ḥadīth no. 500; Jalāl al-Dīn al-Sūyūṭī, Miftāḥ al-Jannah fī al-Iḥtijāj bil Sunnah (Cairo: Idārat al-Ṭibā῾ah al-Munayriyyah, [n.d]), p. 37. 39 Ibn Qutaybah, Ta᾽wīl Mukhtalif al-Ḥadīth, ed. by M. M. al-Aṣfar, 2nd rev. edn (Beirut, al-Maktab al-Islāmī, 1999), p. 412. This treatise is composed of about approximately 1000 ahaadeeth. Ibn Atheer mentioned this in Asad al-Ghaabah FeeTarjamah as-Sahaabah (3/233) It remained secure and reserved within his family for a long time. All or most of it can be found in the Musnad of Imaam Ahmad (rahimahullaah). رَأَيْتُ عِنْدَ عَبْدِ اللَّهِ بْنِ عَمْرِو بْنِ الْعَاصِ صَحِيفَةً فَسَأَلْتُ عَنْهَا فَقَالَ: هَذِهِ الصَّادِقَةُ! فِيهَا مَا سَمِعْتُ مِنْ رَسُولِ اللَّهِ - صَلَّى اللَّهُ عَلَيْهِ وَسَلَّمَ - لَيْسَ بَيْنِي وَبَيْنَهُ فِيهَا أَحَدٌ. 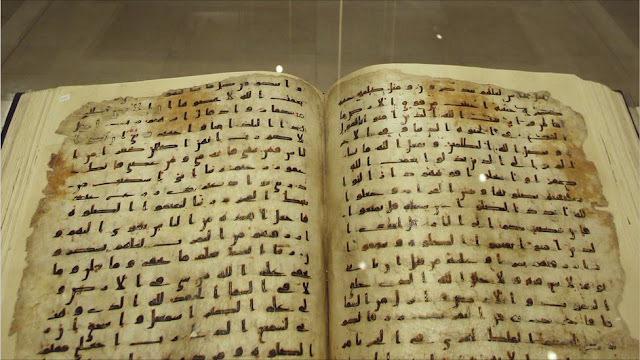 This was later passed on to his great grandson ‘Amr bin Shu’aib (d. 118 A.H.) .Even the book is not extant today still we can perhaps find out the narrations in it. This treatise, after considerable effort by Dr. Hameedullaah, has been printed and distributed from Hyderabad (Deccan). It contains 138 narrations. This Saaheefa is a part of the ahaadeeth narrated from Abu Hurairah, where in one place Imam Ahmad has quoted all of this in his Musnad and the rest/most of its narration’s can be found in Bukhaaree and Muslim; the words of the ahaadeeth are extremely similar and there are no major differences between them. أَخْبَرَنَا مَخْلَدُ بْنُ مَالِكٍ، حَدَّثَنَا مُعَاذٌ، حَدَّثَنَا عِمْرَانُ بْنُ حُدَيْرٍ، عَنْ أَبِي مِجْلَزٍ، عَنْ بَشِيرِ بْنِ نَهِيكٍ، قَالَ: " كُنْتُ أَكْتُبُ مَا أَسْمَعُ مِنْ أَبِي هُرَيْرَةَ رَضِيَ اللَّهُ عَنْهُ، فَلَمَّا أَرَدْتُ أَنْ أُفَارِقَهُ، أَتَيْتُهُ بِكِتَابِهِ فَقَرَأْتُهُ عَلَيْهِ، وَقُلْتُ لَهُ: هَذَا سَمِعْتُ مِنْكَ؟ قَالَ: نَعَمْ "
154 - حَدَّثَنَا أَبُو خَيْثَمَةَ ثنا وَكِيعٌ، عَنْ عِمْرَانَ بْنِ حُدَيْرٍ، عَنْ أَبِي مِجْلَزٍ، عَنْ بَشِيرِ بْنِ نَهِيكٍ، قَالَ: " كَتَبْتُ عَنْ أَبِي هُرَيْرَةَ كِتَابًا فَلَمَّا أَرَدْتُ أُفَارِقُهُ قُلْتُ: يَا أَبَا هُرَيْرَةَ إِنِّي كَتَبْتُ عَنْكَ كِتَابًا فَأَرْوِيهِ عَنْكَ؟ قَالَ: نَعَمِ ارْوِهِ عَنِّي "
Abu Khaithama narrated to us, saying: Wakee' reported to us from 'Imraan Ibn Hudair  from Abu Mujliz on the authority of Basheer Ibn Naheek that he said: "I recorded a collection (of hadeeth) from Abu Hurairah. Then when I desired to part from him, I said 'O Abu Hurairah! I recorded a book (of hadeeth) from you, so shall I narrate them on your authority.' He said: 'Yes, narrate on my authority.'" But there is no contradiction here, for it appears Abu Huraira did not record the Ahadith in written form during the lifetime of the Holy Prophet, may Allah bless him, and initial years of Khilafa but later he started writing them. Abu Hurairah (Radhiallahu Anhu) had an astounding and incredible memory due to the supplication of the Messenger of Allaah (Sallalhu Alayhi Wasallam). Once Marwaan bin al-Hakam al-Amawee wrote some ahadeeth from Abu Hurairah (Radhiallahu Anhu) and in the following year he returned and said to Abu Hurairah (Radhiallahu Anhu) he has lost the book he had copied the hadeeth into so can you tell me them again. So Abu Hurairah (Radhiallahu Anhu) told him the ahadeeth again and when the 2 books were compared (some have said the book was later found) there was not a difference in a single letter. This shows companions started making private Hadith collections right during the lifetime of the Holy Prophet, may Allah bless him. There were many compilations of the ahaadeeth of Ibn Abbaas (radi-Allaahu ‘anhu). Jabir bin Abdullah (d.70 A.H.) is also reported to have made a manuscript of Hadith with narrations on Hajj. Our mother (may allah be well pleased with her) has taught us a great portion of this religion. We have numerous narrations of sahaabis visiting her to resolve their doubts, and how she was among those who taught the most about the prophetic traditions. From the Tabi`een: Ibraaheem bin Zaid al-Nakha`ee (in a broken form), Ibraaheem bin Yazeed al-Taymee (also in a broken form), Is-ḥaaq bin Ṫalḥah, Is-ḥaaq bn `Amr, Ḥarith bin Noufal, al-Hasan, her slave Zakwaan, Sa`eed bin al-Musayyib, Sa`sa`ah, Tawoos, Ṫalḥah bin `Abdullaah al-Taymee, `Abbaad bin `Abdullaah bin al-Zubair, `Abdul Rahmaan bin Ka`b bin Maalik, `Abdullaah bin `Aamir bin Rabee`ah, `Abdullaah bin Abu Mulaikah, `Ikrimah, `Alqamah, Mujaahid, Ibn Sireen, Ḥafṣah – the daughter of her brother `Abdul Raḥmaan, Khairah – the mother of al-Hasan al-Baṣree, and many more have narrated from 'Aisha (R.a) [See Siyar A`laam al-Nubalaa’ of al-Dhahabee for the complete list]. Another great companion, Abdullah bin Mas’ud (d. 32 A.H.), may Allah be pleased with him, also had his own manuscript. وَقَالَ: وَنا أَبُو أُسَامَةَ، عَنْ مِسْعَرٍ، عَنْ مَعْنٍ قَالَ: " أَخْرَجَ إِلَيَّ عَبْدُ الرَّحْمَنِ بْنُ عَبْدِ اللَّهِ بْنِ مَسْعُودٍ كِتَابًا وَحَلَفَ لِي: إِنَّهُ خَطُّ أَبِيهِ بِيَدِهِ "
See the book kitab al-sard wal-fard by imam al-qazwini. Verily We: it is We Who have sent down the Dhikr [i.e. the Qur'an] and surely, We will guard it [from corruption]) (Qur'an 15: 9). 1. تفسير مجاهد ( ت104 ه ) . 2. جزء فِيْهِ أحاديث الإمام أيوب السختياني : إِسْمَاعِيْل بن اسحاق الْقَاضِي (ت 131 ه ) . 3. صحيفة همام بن منبه عَنْ أبي هُرَيْرَةَ ( ت 132 ه ) . 4. تفسير مُحَمَّد بن السائب الكلبي ( ت 146 ه ) . 5. جزء ابن جريج ( 149 ه ) . 6. مسند أبي حَنِيْفَةَ ( ت 150 ه ) : رواية الحصكفي ( ت 650 ه ) . 7. سيرة ابن إسحاق ( ت 150 ه ) . 8. جامع معمر بن راشد ( ت 154 ه ) . 9. سنن الأوزاعي ( ت 157 ه ) . 11. الفرائض : سُفْيَان الثوري ( ت 161 ه ) . 12. مشيخة ابن طهمان ( ت 163 ه ) . 13. مجلس فوائد الليث بن سعد ( ت 175 ه ) . 14. الموطأ : مالك بن أنس ( ت 179 ه ) . 15. المدونة : مالك بن أنس ( ت 179 ه ) . 16. الزهد : عبد الله بن المبارك (ت 181 ه ) . 17. البر والصلة : عبد الله بن المبارك ( ت 181 ه ) . 18. الجهاد : عَبْد الله بن المبارك ( ت 181 ه ) . 19. مسند عَبْد الله بن المبارك ( ت 181 ه ) . 20. الآثار : أبو يوسف ( ت 182 ه ) . 21. الخراج : لأبي يوسف ( ت 183 ه ) . 22. كتاب الزهد : المعافي ( ت 185 ه ) . 23. الآثار : مُحَمَّد بن الحسن ( ت 189 ه ) . 24. الحجة : محمد بن الحسن ( ت 189 ه ) . 25. الزهد : وكيع بن الجراح ( ت 196 ه ) . 26. القدر : عبدالله بن وهب ( ت 197 ه ) . 27. جامع ابن وهب : عبدالله بن وهب ( ت 197 ه ) . 28. جزء في حَدِيْث سُفْيَان بن عيينة ( ت 198 ه ) . 29. الخراج : يحيى بن آدم ( ت 203 ه ) . 30. المسند : الشَّافِعِيّ ( ت 204 ه ) . 31. الأم : الشَّافِعِيّ ( ت 204 ه ) . 32. الرسالة : الشَّافِعِيّ ( ت 204 ه ) . 33. اختلاف الْحَدِيْث : الشَّافِعِيّ ( ت 204 ه ) . 34. أحكام القرآن : الشافعي ( ت 204 ه ) . 35. السنن المأثورة : الشَّافِعِيّ ( ت 204 ه ) . 36. المسند : الطيالسي ( ت 204 ه ) . 37. معاني القرآن : أبو زكريا الفراء ( ت 207 ه ) . 38. المغازي : الواقدي ( ت 207 ه ) . 39. فتوح الشام : مُحَمَّد بن عمر الواقدي ( 207 ه ) . 40. مسند عَبْد الرحمان بن عوف : أحمد البرتي ( ت 208 ه ) . 41. جزء أشيب : الحسن بن موسى الأشيب ( ت 209 ه ) . 42. المصنف : عَبْد الرزاق بن همام ( ت 211 ه ) . 43. التفسير : عَبْد الرزاق بن همام ( ت 211 ه ) . 44. السيرة النبوية : ابن هشام ( ت 218 ه ) . 45. نسخة أبي مسهر : عَبْد الأعلى بن مسهر ( ت 218 ه ) . 46. المسند : الحميدي ( ت 219 ه ) . 47. الأموال : لأبي عبيد ( ت 224 ه ) . 48. الناسخ والمنسوخ : أَبُو عبيد ( ت 224 ه ) . 49. الإيمان : لأبي عبيد ( ت 224 ه ) . 50. غريب الْحَدِيْث : لأبي عبيد ( 224 ه ) . 51. فضائل القرآن : أبو عبيد ( ت 224 ه ) . 52. الطهور : أبي عبيد القاسم بن سلام ( ت 224 ه ) . 53. السنن : سعيد بن منصور ( ت 227 ه ) . 54. التفسير : سعيد بن مَنْصُوْر ( ت 227 ه ) . 55. الفتن : نُعَيْم بن حماد المروزي : ( ت 228 ه ) . 57. الطبقات الكبرى : لابن سعد ( 230 ه ) . 58. القسم المتمم : لابن سعد ( ت 230 ه ) . 59. المسند : علي بن الجعد ( ت 230 ه ) . 60. العِلْم : لأبي خيثمة زهير بن حرب (ت 234 ه ) . 61. العلل : المديني ( ت 234 ه ) . 62. كتاب الأدب : ابن أبي شيبة ( ت 235 ه ) . 63. المصنف : ابن أبي شيبة ( ت 235 ه ) . 64. الجزء المفقود من كتاب المصنف : ابن أبي شيبة ( ت 235 ه ) . 65. الأوائل : ابن أبي شيبة ( ت 235 ه ) . 66. الإيمان : ابن أبي شيبة ( ت 235 ه ) . 67. المسند : ابن أَبِي شيبة ( ت 235 ه ) . 68. التاريخ : ابن أبي شيبة ( ت 235 ه ) . ( خ ) . 70. كتاب وصف الفردوس : عَبْد الملك بن حبيب السلمي القرطبي ( ت 238 ه ) . 71. الكرم والجود : أبو الشَّيْخ البرجلاني ( ت 238 ه ) . 72. مسند خليفة بن خياط ( 240 ه ) . 73. تاريخ خليفة بن خياط ( 240 ه ) . 74. كتاب الطبقات : خليفة بن خياط ( 240 ه ) . 75. المسند : أحمد بن حنبل ( ت 241 ه ) . 76. كتاب الورع : أحمد بن حنبل ( ت 241 ه ) . 77. فضائل الصَّحَابَة : أحمد بن حنبل ( ت 241 ه ) . 78. العقيدة : أحمد بن حنبل – رِوَايَة أبي بكر الخلال - ( ت 241 ه ) . 79. العلل : أحمد بن حنبل ( ت 241 ه ) . 80. السنة : أحمد بن حنبل ( ت 241 ه ) . 81. الأشربة : أحمد بن حنبل ( ت 241 ه ) . 82. الزهد : أحمد بن حنبل ( ت 241 ه ) . 83. الزهد : هناد بن السري ( ت 243 ه ) . 84. الإيمان : العدني ( ت 243 ه ) . 85. أخبار مكة : الأزرقي ( ت 244 ه ) . 86. مسند سعد بن أبي وقاص أبو عَبْد الله الدورقي البغدادي ( ت 246 ه ) . 87. جزء فِيْهِ قراءات النَّبِيّ :حفص بن عمر ( ت 246 ه ) . 88. المسند : عَبْد بن حميد ( ت 249 ه ) . 89. الأموال : ابن زنجويه ( ت 251 ه ) . 90. جزء المؤمل بن إيهاب ( ت 254 ه ) . 91. السنن : الدارمي ( ت 255 ه ) . 92. الجامع الصَّحِيْح : البُخَارِيّ ( ت 256 ه ) . 93. الأخبار الموفقيات : الزبير بن بكار ( ت 256 ه ) . 94. المنتخب من كتاب أزواج النَّبِيّ : الزبير بن بكار ( ت 256 ه ) . 95. الأدب المفرد : البُخَارِيّ ( ت 256 ه ) . 96. رفع اليدين : البُخَارِيّ ( ت 256 ه ) . 97. القراءة خلف الإمام : البُخَارِيّ ( ت 256 ه ) . 98. خلق أفعال العباد : البخاري ( ت 256 ه ) . 99. التأريخ الكبير : البُخَارِيّ ( ت 256 ه ) . 100. التاريخ الوسيط : البُخَارِيّ ( ت 256 ه ) . 101. جزء الحسن بن عرفة العبدي ( ت 257 ه ) . 102. فتوح مصر والمغرب والأندلس : ابن عَبْد الحكم ( ت 257 ه ) . 103. مسند بلال : أبو عَلِيّ الصباح ( ت 260 ه ) . 104. الجامع الصحيح : مسلم بن الحجاج ( 261 ) . 105. التمييز : مسلم بن الحجاج ( ت 261 ه ) . 106. الكنى : مُسْلِم بن الحجاج ( ت 261 ه ) . 107. الطبقات : مُسْلِم بن الحجاج ( ت 261 ه ) . 108. المنفردات والوحدان : مُسْلِم بن الحجاج ( ت 261 ه ) . 109. مسند عمر : يعقوب بن شيبة ( ت 262ه ) . 110. أخبار المدينة : عمر بن شبّة ( ت 262 ه ) . 111. جزء الأصبهاني : مُحَمَّد الثقفي الأصبهاني ( ت 262 ه) . 112. مختصر المزني : المزني ( ت 264 ه ) . 113. الفوائد : سمويه ( ت 267 ه ) . ( خ ) . 114. الأمالي والقراءة : الحسن ومحمد بن عَلِيّ بن عفان ( ت 270 ه ) . 115. جزء أحمد بن عاصم : ( ت 272ه ) . 116. من حَدِيْث حنبل بن إسحاق ( المعروف بجزء حنبل بن إسحاق ) . ( ت 273 ه ) . 117. مسند عَبْد الله بن عمر : مُحَمَّد بن إِبْرَاهِيْم الطرسوسي ( 273 ه ) . 118. الفتن : حنبل بن اسحاق ( ت273 ه ) . 119. مسائل الإمام أحمد : رِوَايَة ابن هانئ ( ت 275 ) . 120. السنن : لأبي داود السجستاني ( ت 275 ه ) . 121. المراسيل مَعَ الأسانيد : لأبي داود ( ت 275 ه ) . 122. السنن : لابن ماجه ( ت 275 ه ) . 123. تاريخ الخلفاء : ابن ماجه ( ت 275 ه ) . 124. مسائل الإمام أحمد : أبو داود السجستاني ( 275 ه ) . 125. تأويل مختلف الْحَدِيْث : لابن قتيبة ( ت 276 ه ) . 126. عيون الأخبار : ابن قتيبة الدينوري ( ت 276 ه ) . 127. غريب الْحَدِيْث : ابن قتيبة الدينوري ( ت 276 ه ) . 128. ما روي في الحوض والكوثر : بقي بن مخلد ( ت 276 ه ) . 130. السنن : الترمذي ( ت 279 ه ) . 131. الشمائل : الترمذي ( ت 279 ه ) . 132. العلل الكبير : الترمذي ( ت 279 ه ) . 133. أنساب الأشراف : أحمد بن يَحْيَى البلاذري ( ت 279 ه ) . 134. فتوح البلدان : البلاذري ( ت 279ه ) . 135. الرد عَلَى الجهمية : عثمان بن سعيد الدارمي ( ت 280 ه ) . 136. الرد عَلَى بشر المريسي : عثمان بن سعيد الدارمي ( ت 280 ه ) . 137. جزء فِيْهِ حَدِيْث الحَافِظ بن ديزل ( ت 281 ه ) . 138. تاريخ أبي زرعة الدمشقي : عَبْد الرَّحْمَان النصري ( ت 281 ه ) . 139. الأخوان : ابن أبي الدنيا ( ت 281 ه ) . 140. التهجد وقيام الليل : ابن أبي الدنيا ( ت 281 ه) . 141. القبور : ابن أبي الدنيا ( ت 281 ه) . 142. الوجل والتوثق بالعمل : ابن أبي الدنيا ( ت 281 ه) . 143. كتاب العمر والشيب : ابن أبي الدنيا ( ت 281 ه) . 144. الورع : ابن أَبِي الدنيا( ت 281 ه) . 145. اليَقِيْن : ابن أبي الدنيا ( ت 281 ه) . 146. مجابو الدعوة : ابن أبي الدنيا ( ت 281 ه) . 147. محاسبة النفس والإزراء عَلَيْهَا : ابن أبي الدنيا ( ت 281 ه ) . 148. قصر الأمل : ابن أبي الدنيا ( ت 281 ه) . 149. كتاب الشكر لله عز وجل : ابن أبي الدنيا ( ت 281 ه) . 155. العقوبات : ابن أبي الدنيا ( خ ) . 156. الخمول والتواضع : ابن أبي الدنيا ( خ ) . 157. التقوى : ابن أبي الدنيا ( خ ) . 164. الحلم : ابن أبي الدنيا ( ت 281 ه ) . 165. ذم البغي : ابن أبي الدنيا ( ت 281 ه ) . 177. الأحاديث الأربعين : ابن أبي الدنيا ( خ ) . 178. اصطناع المعروف : ابن أبي الدنيا ( خ ) . 180. ذم الدنيا : ابن أبي الدنيا ( ت 281 ه ) . 182. الصمت : ابن أبي الدنيا ( ت 281 ه ) . 183. الأمر بالمعروف والنهي عَنْ المنكر : ابن أبي الدنيا ( خ ) . 184. التوكل : ابن أبي الدنيا ( خ ) . 186. الجيران : ابن أبي الدنيا ( خ ) . 187. الزهد : ابن أبي الدنيا ( خ ) . 188. الرقة : ابن أبي الدنيا ( خ ) . 189. العزلة : ابن أبي الدنيا ( خ ) . 190. العظمة : ابن أبي الدنيا ( خ ) . 191. العيدين : ابن أبي الدنيا ( خ ) . 192. فضل رمضان : ابن أَبِي الدنيا ( خ ) . 193. الإخلاص : لابن أبي الدنيا ( ت 281 ه ) . 194. صفة الجنة : لابن أبي الدنيا ( ت 281 ه ) . 195. ذم الغيبة : لابن أبي الدنيا ( ت 281 ه ) . 202. من عاش بَعْدَ الموت : ابن أبي الدنيا ( ت 281 ه ) . 203. عوالي الحارث ابن أبي أسامة ( ت 282 ه ) . 204. فضل الصَّلاَة عَلَى النَّبِيّ : إِسْمَاعِيْل بن إسحاق الْقَاضِي ( 282 ه ) . 205. جزء إكرام الضيف : أبو إسحاق الحربي ( ت 285 ه ) . 206. غريب الْحَدِيْث : ابن إسحاق الحربي ( ت 285 ه ) . 207. الكامل في اللغة والأدب : المبرد ( ت 285 ه ) . 208. البدع والنهي عَنْهَا : لابن وضّاح ( ت 286 ه ) . 209. الأوائل : أَحْمَد بن أَبِي عاصم النبيل : ( 287 ه ) . 210. كتاب السنة : عَبْد الله بن أَحْمَد بن حنبل الشيباني ( ت 287 ه ) . 211. مسائل الإمام أحمد : رِوَايَة ابنه عَبْد الله ( ت 287 ه ) . 212. الديات : لابن أبي عاصم ( ت 287 ه ) . 213. السنة : لابن أبي عاصم ( ت 287 ه ) . 216. الآحاد والمثاني : لابن أبي عاصم ( ت 287 ه ) . 217. الصَّلاَة عَلَى النَّبِيّ : لابن أبي عاصم ( ت 287 ه ) . 218. الزهد : لابن أبي عاصم ( ت 287 ه ) . 219. مسند أبي بكر الصديق : المروزي ( ت 292 ه ) . 220. تاريخ واسط : بحشل ( ت 292 ه ) . 221. البحر الزخار : البزار ( ت 292 ه ) . 222. الْجمعة وفضلها : أبو بكر المروزي ( 292 ه ) . 223. فضائل القرآن : ابن الضريس ( ت 294 ه ) . 224. مختصر قيام الليل وقيام رمضان وكتاب الوتر : المروزي ( ت 294 ه ) . 225. الورع : المروزي ( ت 294 ه ) . ( خ ) . 226. السنة : المروزي ( ت 294 ه ) . 227. جزء فِيْهِ تفسير القرآن ليحيى بن يَمان : الرملي ( ت 295 ه ) . 228. نوادر الأصول : الحكيم التِّرْمِذِيّ ( 295 ه ) . 229. الأمثال من الكِتَاب والسنة : الحكيم التِّرْمِذِيّ ( 295 ه ) . 230. كتاب العرش وماروي فِيْهِ : مُحَمَّد بن عثمان بن أبي شيبة ( ت 297 ه ) . 231. أحكام العيدين : الفريابي ( ت 301 ه ) . 232. فضائل القرآن : الفريابي ( ت 301 ه ) . 233. القدر : الفريابي ( ت 301 ه ) . 234. صفة النفاق وذم المنافقين : الفريابي ( ت 301 ه ) . 235. دلائل النبوة : أبو بكر الفريابي ( ت 301 ه ) . 236. السنن الكبرى : النسائي ( ت 303 ه ) . 237. خصائص أمير المؤمنين عَلِيّ : النسائي ( ت 303 ه ) . 238. تفسير النَّسائي : ( ت 303 ه ) . 239. كتاب الجمعة : النسائي ( ت 303 ه ) . 240. جزء إملاء النسائي ( ت 303 ه ) . 241. الأربعون : الحسن بن سُفْيَان ( ت 303 ) . 242. المجتبى : النسائي ( ت 303 ه ) . 243. فضائل الصَّحَابَة : النسائي ( ت 303 ه ) . 244. فضائل القرآن : النسائي ( ت 303 ه ) . 245. عمل اليوم والليلة : النسائي ( ت 303 ه ) . 246. عشرة النساء : النسائي ( ت 303 ه ) . 247. كتاب الوفاة : النسائي ( ت 303 ه ) . 248. أخبارالقضاة : وكيع ( ت 306 ه ) . 249. ذم اللواط : أبو مُحَمَّد بن خلف الدوري ( ت 307 ه ) . 250. المسند : لأبي يعلى ( ت 307 ه ) . 251. معجم شيوخ أبي يعلى الموصلي ( ت 307 ه ) . 252. المفاريد : لأبي يعلى ( ت 307 ه ) . 253. المنتقى : لابن الجارود ( ت 307 ه ) . 254. مسند الروياني ( ت307 ه ) . 255. فضائل المدينة : الجندي ( ت 308 ه ) . 256. ذم الثقلاء : أبو بكر مُحَمَّد بن خلف بن المرزبان ( ت 309 ه ) . 257. كتاب الأمالي : يَحْيَى بن المبارك اليزيدي ( ت 310 ه ) . 258. الذرية الطاهرة النبوية : الدولابي ( ت 310 ه ) . 259. تفسير الطبري : ( ت 310 ه ) . 260. المنتخب من ذيل المذيل في تاريخ الصَّحَابَة والتابعين : الطبري ( ت 310 ه ) . 261. تهذيب الآثار : الطبري ( ت 310 ه ) . 262. تاريخ الطبري ( تاريخ الرسل والملوك ) . : الطبري ( ت 310 ه ) . 263. صريح السنة : الطبري ( ت 310 ه ) . 264. الكنى : للدولابي ( ت 310 ه ) . 265. الأمر بالمعروف والنهي عَن المنكر : أبو بكر الخلال ( ت 311 ه ) . 266. أحكام أهل الملل : الخلال ( ت 311 ه ) . 267. الحث عَلَى التجارة والصناعة والعمل : الخلال ( ت 311 ه ) . 268. الأمالي : الخلال ( ت 311 ه ) . 269. صَحِيْح ابن خزيمة ( ت 311 ه ) . 270. التوحيد : لابن خزيمة ( ت 311 ه ) . 272. مسند أمير المؤمنين عمر بن عَبْد العزيز : ابن الباغندي ( ت 312 ه ) . 273. الصَّحِيْح : لأبي عوانة ( ت 316 ه ) . 275. كتاب المصاحف : السجستاني ( ت 316 ه ) . 276. مسند عَائِشَة : ابن أبي داود السجستاني ( ت 316 ه ) . 278. جزء فِيْهِ ثلاث وثلاثون حديثاً : ابن مُحَمَّد البغوي ( 317 ه ) . 279. مسند ابن أبي أوفى : يَحْيَى بن مُحَمَّد بن صاعد ( ت 318 ه ) . 281. أحاديث أبي عروبة الحراني ( ت 318 ه ) . 282. المجتنى : أبو بكر بن دريد ( 320 ه ) . 283. الضعفاء الكبير : للعقيلي ( ت 322 ه ) . 284. جزء الحميري ( ت 323 ه ) . 285. شرح معاني الآثار : الطحاوي ( ت 327 ه ) . 286. شرح مشكل الآثار : للطحاوي ( 327 ه ) . 287. مساوئ الأخلاق : للخرائطي ( ت 327 ه ) . 288. مكارم الأخلاق ومعاليها : الخرائطي ( ت 327 ه ) . 289. كتاب فضيلة الشكر عَلَى نعمته : الخرائطي ( ت 327 ه ) . 290. كتاب المراسيل : ابن أبي حاتم الرازي ( ت 327 ه ) . 291. الجرح والتعديل : لابن أبي حاتم ( ت 327 ) . 292. علل الحديث : لابن أبي حاتم ( ت 327 ) . 293. التفسير : لابن أبي حاتم ( ت 327 ه ) . 294. صلاة العيدين : المحاملي ( ت 330 ه ) . ( خ ) . 295. أمالي المحاملي ( ت 330 ه ) . 297. ما رواه الأكابر عَنْ مالك بن أنس : مُحَمَّد بن مخلد المروزي ( ت 331 ه ) . 298. طبقات علماء إفريقيا : لأبي العرب التميمي ( ت 333 ه ) . 299. المجالسة : أبو بكر الدينوري ( ت 333ه ) . 300. كتاب المحن : مُحَمَّد بن أحمد بن تميم التميمي ( ت 333 ه ) . 301. تاريخ الرقة : الحراني ( 334 ه ) . 302. أمالي الزجاجي ( ت 337 ه ) . 303. الناسخ والمنسوخ : النحاس ( ت 339ه ) . 304. الزهد وصفة الزاهدين : ابن الأعرابي ( ت 341 ه ) . 305. معجم شيوخ ابن الأعرابي ( ت341 ه ) . 306. حَدِيْث خيثمة بن سليمان القرشي الإطرابلسي ( ت 343 ه ) . 307. المسند : الشاشي ( ت 350 ه ) . 308. المنتقى من مسند المقلين : دعلج بن أحمد أبي مُحَمَّد السجزي ( ت 351 ه ) . 309. معجم الصَّحَابَة : ابن قانع ( ت 351 ه ) . 310. أخبار مكة : الفاكهي ( ت 353 ه ) . 311. الغيلانيات : أبو بكر الشَّافِعِيّ ( 354 ه ) . 312. عوالي الغيلانيات : أبو بكر الشَّافِعِيّ ( 354 ه ) . 313. الإحسان : ابن حبان ( ت 354 ه ) . 314. تاريخ الصَّحَابَة : ابن حبان ( ت 354 ه ) . 315. الثقات : ابن حبان ( ت 354 ه ) . 316. المجروحين : ابن حبان ( ت 354 ه ) . 317. روضة العقلاء ونزهة الفضلاء : لأبي حاتم بن حبان البستي ( ت 354 ه ) . 318. كتاب الأمالي : أبو عَلِيّ القالي ( ت 356 ه ) . 319. مجلس البطاقة : حمزة الكناني ( 357 ه ) . 320. فوائد أبي عَلِيّ مُحَمَّد بن أحمد بن حسن الصواف ( ت359 ه ) . 322. تحريم النرد : الآجري ( ت 360 ه ) . 323. أخلاق حملة القرآن : الآجري ( 360 ه ) . 324. كتاب الغرباء من المؤمنين : الآجري ( ت 360 ه ) . 325. أدب النفوس : الآجري ( ت 360 ه ) . ( خ ) . 326. الشريعة : الآجري ( ت 360 ه ) . 327. مسألة الطائفين : الآجري ( ت 360 ه ) . 328. الأربعون حديثاً التِي حثَّ النَّبِيّ عَلَى حفظها : الآجري (ت 360 ه ) . 329. الأمثال : الرَّامَهُرْمُزِيّ ( ت 360 ه ) . 330. المحدث الفاصل : الرامهرمزي ( ت 360 ه ) . 331. مكارم الأخلاق : الطبراني ( ت 360 ه ) . 332. المعجم الكبير : الطبراني ( ت 360 ه ) . 333. كتاب الأوائل : الطبراني ( ت 360 ه ) . 334. من اسمه عطاء من رواة الأحاديث : الطبراني ( ت 360 ه ) . 335. المعجم الأوسط : الطبراني ( ت 360 ه ) . 336. المعجم الصغير : الطبراني ( ت 360 ه ) . 337. الأحاديث الطوال : الطبراني ( ت 360 ه ) . 338. الدعاء : الطبراني ( ت 360 ه ) . 339. مسند الشاميين : الطبراني ( ت 360 ه ) . 340. طرق حَدِيْث من كذب عَلِيّ : الطبراني ( ت360 ه ) . 341. تحريم اللواط : الآجري ( ت 360 ه ) . 342. الأغاني : لأبي الفرج الأصفهاني ( ت 360 ه ) . 343. عمل اليوم والليلة : ابن السني ( ت 364 ه ) . 344. كتاب القناعة : لابي بكر بن السني ( ت 364 ه ) . 345. الكامل : ابن عدي ( ت 365 ه ) . 346. رجال البُخَارِيّ : ابن عدي ( ت 365 ه ) . 347. المخزون في علم الْحَدِيْث : الأسدي الموصلي ( ت 367 ه ) . 348. أخلاق النَّبِيّ : لأبي الشَّيْخ ( 369 ه ) . 349. التوبيخ والتنبيه : لأبي الشَّيْخ ( ت 369 ه ) . 350. الأذان : لأبي الشَّيْخ ابن حيان ( ت 369 ه ) . 351. كتاب العظمة : أبو الشَّيْخ ( 369 ه ) . 352. ذكر رِوَايَة الأقران : أَبُو الشَّيْخ ( 369 ه ) . 353. طبقات الْمُحَدِّثِيْنَ بأصبهان : أبو الشَّيْخ ( ت 369 ه ) . 354. جزء فِيْهِ أحاديث أبي الزبير عَنْ غَيْر جابر : أبو الشَّيْخ الأصبهاني ( ت 369 ه ) . 355. الأمثال في الْحَدِيْث النبوي : أبو الشَّيْخ الأصبهاني ( ت 369 ه ) . 356. أحكام القرآن : الجصاص ( ت 370 ه ) . 357. تاريخ داريا : عَبْد الجبار الخولاني ( ت 370 ه ) . 358. كتاب معجم شيوخ الإسماعيلي : أحمد بن إِبْرَاهِيْم الإسماعيلي ( ت 371 ه ) . 359. من وافق اسمه اسم أبيه : الأزدي ( ت 374 ه ) . 360. من وافق اسمه كنية أبيه : أبو الفتح الأزدي ( ت 374 ه ) . 361. تنبيه الغافلين : لأبي الليث السمرقندي ( ت 375 ه ) . 362. بحر العلوم : لأبي الليث السمرقندي ( ت 375 ه ) . 363. جزء ابن الغطريف ( ت 377 ه ) . 364. الكنى : لأبي أحمد الحَاكِم الكبير ( 378 ه ) . 365. شعار أصحاب الْحَدِيْث : أبو أحمد الحَاكِم ( ت 378 ه ) . 366. تاريخ مولد الْعُلَمَاء ووفياتهم : ابن الزبر الربيعي ( ت 379 ه ) . 367. غرائب مالك : ابن المظفر ( ت 379 ه ) . 368. غرائب شعبة : ابن المظفر ( ت 379 ه ) . 369. تقبيل اليد : مُحَمَّد بن إبراهيم المقريء ( ت 381 ه ) . 370. جزء فِيْهِ أحاديث نافع بن أبي نُعَيْم : مُحَمَّد بن إِبْرَاهِيْم المقريء ( ت 381 ه ) . 371. المعجم لابن المقريء ( ت 381 ه ) . 372. تصحيفات الْمُحَدِّثِيْنَ : العسكري ( ت 382 ه ) . 373. بحر الفوائد المَشْهُوْر بمعاني الأخبار : الكلاباذي ( ت 384 ه ) . 374. كتاب الأسخياء : الدَّارَقُطْنِيّ ( ت 385 ه ) . 375. الأخوة والأخوات : الدَّارَقُطْنِيّ ( ت 385 ه ) ( خ ) . 376. أربعون حديثاً من مسند بريد بن عَبْد الله بن أبي بردة : الدَّارَقُطْنِيّ ( ت 385 ه ) ( خ ) . 377. رؤية الله : الدَّارَقُطْنِيّ ( ت 385ه ) . 378. المؤتلف والمختلف : الدَّارَقُطْنِيّ( ت 385 ه ) . 379. كتاب النـزول والصفات : الدارقطني ( ت 385 ه ) . 380. من حَدِيْث أبي الطاهر : الدارقطني ( ت 385 ه ) . 382. ناسخ الْحَدِيْث ومنسوخه : ابن شاهين ( ت 385 ه ) . 383. فضائل شهر رمضان : ابن شاهين ( ت 385 ه ) . 385. السنن : الدارقطني ( ت 385 ه ) . 386. أحاديث الموطأ واتفاق الرُّوَاة عَنْ مالك واختلافهم فِيْهَا زيادة ونقصان : الدارقطني ( ت 385 ه ) . 387. العلل : الدارقطني ( ت 385 ه ) . 388. الأفراد : الدارقطني ( ت 385 ه ) . 389. إبطال الحيل : ابن بطة ( ت 387 ه ) . 390. الإبانة الكبرى : ابن بطة العكبري ( ت 387 ه ) . 391. الإبانة الصغرى : ابن بطة العكبري ( ت 387 ه ) . 392. غريب الْحَدِيْث : الخطابي ( ت 388 ه ) . 393. فضائل التسمية : الْحُسَيْن بن أحمد بن بكير ( ت 388 ه ) . 394. العزلة : الخطّابي ( ت 388 ه ) . 395. شأن الدعاء : الخطابي ( ت 388 ه ) . 396. كتاب الملاهي وأسمائها : المفضل بن سلمة ( ت 390 ه ) . 397. الجليس الصالح الكافي والأنيس الناصح الشافي : المعافى بن زكريا ( ت 390 ه ) . 398. تعظيم قدر الصَّلاَة : المروزي ( ت 394 ه ) . 399. الإيمان : ابن منده ( ت 395 ه ) . 400. الكنى : ابن منده ( ت 395 ه ) . 401. الرد عَلَى الجهمية : ابن منده ( 395 ه ) . 403. مسند إبراهيم بن أدهم : ابن منده ( ت 395 ه ) . 404. التوحيد : ابن منده ( ت 395 ه ) . 405. جمهرة الأمثال : أبو هلال العسكري ( 395 ه ) . 406. معجم الشيوخ : الصيداوي ( ت 402 ه ) . 407. المستدرك : الحاكم ( ت 405 ه ) . 408. معرفة علوم الحديث : الحاكم ( ت 405 ه ) . 409. الإكليل : الحَاكِم ( ت 405 ه ) . 410. المدخل إلى الإكليل : الحَاكِم ( ت 405 ه ) . 411. الأوهام التِي في مدخل الحَاكِم : الأزدي ( ت 409 ه ) . 412. الرباعي في الْحَدِيْث : الأزدي ( ت 409 ه ) . 413. الأربعون في شيوخ الصوفية : أبو سعدي الماليني ( ت 409 ه ) . 414. أمالي ابن مردويه ( ت410 ه ) . 415. آداب الصحبة : السلمي : (ت 412 ه ) . 416. طبقات الصوفية : السلمي ( ت 412 ه ) . 417. عيوب النفس : السلمي ( ت 412 ه ) . 418. الروض البسام بترتيب وتخريج فوائد تمام ( ت 414 ه ) . 419. حَدِيْث أبي العشراء الدارمي : أَبُو القاسم الرازي ( ت 414 ه ) . 420. مسند المقلين من الأمراء والسلاطين : تمام الرازي ( 414 ه ) . 421. جزء هلال الحفار ( ت 414 ه ) . ( خ ) . 422. فوائد العراقيين : أبو سعيد النقاش ( ت 414 ه ) . 423. شرح أصول إعتقاد أهل السنة والجماعة : الطبري ( ت 418 ه ) . 424. آداب الدين : السهمي ( ت 427 ه ) . 425. تاريخ جرجان : السهمي ( ت 427 ه ) . 426. الكشف والبيان في تفسير القرآن : أبو إسحاق الثعلبي ( ت 427 ه ) ( خ ) . 427. العرائس في قصص الأنبياء : أبو إسحاق الثعلبي ( ت 427 ه ) . 428. فضائل الرمي : القراب ( ت 429 ه ) . 429. دلائل النبوة : أبو نُعَيْم (ت 430 ه ) . 430. أمالي الأصبهاني : أبو نُعَيْم (ت 430 ه ) . 431. معرفة الصَّحَابَة : أبو نُعَيْم ( ت 430 ه ) . 432. حلية الأولياء : أبو نُعَيْم ( ت 430 ه ) . 433. فضيلة العادلين : أبو نُعَيْم ( ت 430 ه ) . 434. طرق حَدِيْث : إنَّ للهِ تسعاً وتسعينَ اسماً : أبو نُعَيْم ( ت 430 ه ) . 435. مَعْرِفَة الصَّحَابَة : لأبي نُعَيْم ( ت 430 ه ) . 436. جزء من كتاب رياضة الأبدان : أبو نُعَيْم الأصبهاني (ت 430 ه ) . 437. المسند المستخرج عَلَى صَحِيْح مُسْلِم : أبو نُعَيْم الأصبهاني ( ت 430 ه ) . 438. ذكر أخبار أصبهان : لأبي نعيم ( ت 430 ه ) . 439. صفة الجنة : لأبي نُعَيْم ( ت 430 ه ) . 440. تسمية من رَوَى عَنْ سعيد بن مَنْصُوْر عالياً : أبو نُعَيْم الأصبهاني (ت 430 ه ) . 441. تسمية ما انتهى إلينا من الرُّوَاة عَن أبي الفضل بن دكين عالياً : أبو نُعَيْم الأصبهاني (ت 430 ه ) . 442. مسند أبي حَنِيْفَةَ : أبو نُعَيْم الأصبهاني ( ت 430 ه ) . 443. كتاب الضعفاء : أبو نُعَيْم الأصبهاني ( ت 430 ه ) . 444. مسانيد أبي يَحْيَى فراس المكتب : لأبي نُعَيْم الأصبهاني ( ت 430 ه ) . 445. كرامات الأولياء : الحسن بن مُحَمَّد الخلال ( ت 439 ه ) . 446. فضائل سورة الإخلاص : أبو مُحَمَّد الخلال ( ت 439 ه ) . 447. الرسالة الوافية : ابن سعيد الداني ( ت 440 ه ) . 448. التحديد في الإتقان والتجويد : أبو عَمْرو الداني ( ت 440 ه ) . ( ت 441 ه ) . 450. أحاديث الشاموخي ( ت 443 ه ) . .
451. السنن الواردة في الفتن : الداني ( ت 444ه ) . 452. المقنع في مَعْرِفَة مصاحف أهل الأمصار : الداني ( ت 444 ه ) . 453. المحكم في نقط المصاحف : الداني ( ت 444 ه ) . 454. الإرشاد : الخليلي ( ت 446 ه ) . 455. الفوائد العوالي المؤرخة : التنوخي ( ت 447 ه ) . 456. عقيدة السلف وأصحاب الْحَدِيْث : الصابوني ( ت 449 ه ) . 457. فضائل القرآن وتلاوته : أبو فضل الرازي ( ت 454 ه ) . 458. مسند الشهاب : القضاعي ( ت 454 ه ) . 459. المحلى : ابن حزم ( ت 456 ه ) . 460. الإحكام في أصول الأحكام : ابن حزم ( 456 ه ) . 461. الفصل في الملل والأهواء والنحل : ابن حزم ( 456 ه ) . 463. فضائل الأوقات : البَيْهَقِيّ ( ت 458 ه ) . 464. الزهد الكبير : البَيْهَقِيّ ( 458 ه ) . 465. السنن الكبرى : البَيْهَقِيّ ( ت 458 ه ) . 466. حياة الأنبياء : البَيْهَقِيّ ( ت 458 ه ) . 467. الخلافيات : البَيْهَقِيّ ( ت 458 ه ) . 468. الدعوات الكبير : البَيْهَقِيّ ( 458 ه ) . 469. الأربعون الصغرى : البَيْهَقِيّ ( ت 458 ه ) . 470. إثبات عذاب القبر : البَيْهَقِيّ ( ت 458 ه ) . 471. القراءة خلف الإمام : البَيْهَقِيّ ( ت 458 ه ) . 472. السنن الصغرى : البيهقي ( ت 458 ه ) . 473. السنن الوسطى ( أو مَعْرِفَة السنن والآثار ) : البيهقي ( ت 458 ه ) . 474. الآداب : البيهقي ( ت 458 ه ) . 475. الاعتقاد : البيهقي ( ت 458 ه ) . 476. شعب الإيمان : البيهقي ( ت 458 ه ) . 477. المدخل : البيهقي ( ت 458 ه ) . 478. البعث والنشور : البيهقي ( ت 458 ه ) . 479. دلائل النبوة : البيهقي ( ت 458 ه ) . 480. الأسماء والصفات : البيهقي ( ت 458 ه ) . 481. تاريخ بغداد : الْخَطِيْب البغدادي ( 463 ه ) . 482. الكفاية : الْخَطِيْب البغدادي ( ت 463 ه ) . 483. الجامع : الْخَطِيْب البغدادي ( ت 463 ه ) . 484. حَدِيْث الستة من التابعين : الْخَطِيْب البغدادي ( 463 ه ) . 485. الرحلة : الْخَطِيْب البغدادي ( ت 463 ه ) . 486. الفصل : الْخَطِيْب البغدادي ( ت 463 ه ) . 487. نصيحة أهل الْحَدِيْث : الْخَطِيْب البغدادي ( ت 463 ه ) . 488. المبهمات : الْخَطِيْب البغدادي ( ت 463 ه ) . 489. الموضح : الْخَطِيْب البغدادي ( ت 463 ه ) . 490. البخلاء : الْخَطِيْب البغدادي ( ت 463 ه ) . 491. كتاب المتفق والمفترق : الْخَطِيْب البغدادي ( ت 463 ه ) . 492. المزيد في متصل الأسانيد : الْخَطِيْب البغدادي ( ت 463 ه ) . 493. السابق واللاحق : الْخَطِيْب البغدادي ( ت 463 ه ) . 494. التلخيص : الْخَطِيْب البغدادي ( ت 463 ه ) . 495. تالي التلخيص : الْخَطِيْب البغدادي ( 463 ه ) . 496. تقييد العلم : الْخَطِيْب البغدادي (ت 463ه ) . 497. اقتضاء العِلْم والعمل : الْخَطِيْب البغدادي ( ت 463 ه ) . 498. التطفيل : الْخَطِيْب البغدادي( ت 463 ه ) . 499. كتاب الفقيه والمتفقه : الْخَطِيْب البغدادي ( ت 463 ه ) . 501. غنية الملتمس في إيضاح الملتبس : الخطيب البغدادي ( ت 463 ه ) . 502. مسلسل العيدين : الخطيب البغدادي ( ت 463 ه ) . 503. المنتخب من كتاب الزهد والرقائق : الخطيب البغدادي ( ت 463 ه ) . 504. جزء فيه طرق حَدِيْث عَبْد الله بن عمر في ترائي الهلال : الخطيب البغدادي ( ت 463 ه ) . 505. الإنباه عَلَى قبائل الرُّوَاة : ابن عَبْد البر ( ت 463 ه ) . 506. بهجة المجالس وأنس المجالس : ابن عَبْد البر ( ت 463 ه ) . 507. التمهيد : ابن عَبْد البر ( ت 463 ه ) . 508. الإنصاف فِيْمَا بَيْنَ الْعُلَمَاء من الاختلاف : ابن عَبْد البر ( ت 463 ه ) . 509. الاستذكار : ابن عَبْد البر ( ت 463 ه ) . 510. الاستيعاب : ابن عَبْد البر ( ت 463 ه ) . 511. الاستغنا : ابن عَبْد البر ( ت 463 ه ) . 512. جامع بَيَان العِلْم : ابن عَبْد البر ( ت 463 ه) . 513. الرسالة القشيرية : للقشيري ( ت 465 ه ) . 514. أسباب النـزول : الواحدي ( ت 468 ه ) . 515. الوجيز : الواحدي ( ت 468 ه ) . 516. الوسيط : الواحدي ( ت 468 ه ) . 517. فضل التهليل وثوابه الجزيل : ابن البناء ( ت 471 ه ) . 518. فوائد ابن منده : أبو عَمْرو بن منده ( ت 475 ه ) . 519. جزء بيبي بنت عَبْد الصمد الهروية الهرثمية عَن ابن أبي شريح ( ت 477 ه ) . 520. الأربعون في دلائل التوحيد : الهروي ( 481 ه ) . 521. تحريم نكاح المتعة : أبو الفتح المقدسي ( ت 490 ه ) . 522. جزء فِيْهِ أحاديث ابن حيان بن مردويه ( ت 498 ه ) . 523. التنبيه عَلَى الأوهام الواقعة في الصحيحين : أبو علي الغساني ( ت 498 ه ) . 524. مسألة العلو والنـزول في الْحَدِيْث : القيسراني ( ت 507 ه ) . 525. كتاب السماع : ابن القيسراني ( ت 507 ه ) . 526. فردوس الأخبار : أبو شجاع الديلمي ( ت 509 ه ) . 527. ثواب قضاء حوائج الإخوان : لأبي الغنائم النرسي (ت 510 ه ) . 528. كتاب فِيْهِ مَعْرِفَة أسامي أرداف النَّبِيّ ابن منده ( ت511 ه ) . 529. جزء فِيْهِ من عاش مئة وعشرين سنة من الصَّحَابَة : ابن منده ( ت 511 ه ) . 530. شرح السنة : البغوي ( ت 516 ه ) . 531. التفسير : البغوي ( ت 516 ه ) . 532. الأنوار شمائل النَّبِيّ المختار : لأبي مُحَمَّد البغوي ( ت 516 ه ) . 533. مجمع الأمثال : الميداني ( ت 518 ه ) . 534. السداسيات : للشحامي ( ت 533 ه ) . ( خ ) . 535. الحجة في بَيَان المحجة : لأبي قاسم الأصبهاني ( ت 535 ه ) . 536. الترغيب والترهيب : ابن الفضل الجوزي الأصبهاني ( ت 535ه ) . 537. الأمالي الشجرية : هبة الله أبو السعادات ( 542 ه ) . 538. الأباطيل والمناكير والمشاهير : الجورقاني ( ت 543 ه ) . 539. أحكام القرآن : ابن العربي ( ت 543 ه ) . 540. الإلماع : الْقَاضِي عِيَاض ( ت 544 ه ) . 541. الغنية : الْقَاضِي عِيَاض ( ت 544 ه ) . 542. مسند الفردوس : أبو منصور الديلمي ( ت 558 ه ) . 543. الغنية لطالب طريف الحق : عَبْد القادر الجيلاني ( ت 561 ه ) . 544. أدب الإملاء : ابن السمعاني ( ت 562 ه ) . 545. تاريخ دمشق : ابن عساكر ( ت 571 ه ) . 546. تعزية المسلم : ابن عساكر ( ت 571ه ) . 547. مدح التواضع وذم الكبر : ابن عساكر ( ت 571 ه ) . 548. الأربعين في الجهاد : ابن عساكر ( ت 571 ه ) . 549. الأربعون البلدانية : ابن عساكر ( ت 571 ه ) . 550. مشيخة ابن الخطاب ( ت 576 ه ) . 551. معجم السفر : ابن إِبْرَاهِيْم الأصفهاني ( ت 576 ه ) . 552. غوامض الأسماء المبهمة : ابن بشكوال ( ت 578 ه ) . 553. الذيل عَلَى جزء بقي بن مخلد : ابن بشكوال ( ت 578 ه ) . 554. التهجد : عَبْد الحق الإشبيلي ( ت 581 ه ) . 555. نزهة الحفاظ : مُحَمَّد بن عمر المديني (ت 581 ه ) . 556. اللطائف من دقائق المعارف : ابن أبي عيسى المدني ( 581ه ) . 557. الاعتبار : الحازمي ( ت 584 ه ) . 558. العلل الْمتناهية : ابن الجوزي ( ت 597 ه ) . 559. الموضوعات : ابن الجوزي ( ت 597 ه ) . 560. مشيخة ابن الجوزي : ابن الجوزي ( ت 597 ه ) . 561. أسد الغابة في مَعْرِفَة الصَّحَابَة : ابن الأثير ( ت 606 ه ) . 562. كتاب الأربعين : أبو الحسن الطوسي ( ت 617 ه ) . 563. الأربعين في الجهاد : أبو الفرج المقريء ( 618 ه ) . 564. الأربعين في مناقب أمهات المؤمنين : هبة الله ابن عساكر ( ت 620 ه ) . 565. التدوين لأخبار قزوين : الرافعي (ت 623 ه ) . 566. التقييد لمعرفة رواة السنن والمسانيد : ابن النقطة الحنبلي ( 629 ه ) . 567. المغني : ابن قدامة المقدسي ( 630 ه ) . 568. أداء ما وجب من بَيَان وضع الوضاعين في رجب : عمر بن حسن بن دحية ( ت 0633ه ) . 569. ذيل تاريخ بغداد : ابن الدبيثي ( ت 637 ه ) . 570. تاريخ دنيسر : عمر بن الخضر بن اللمش ( ت 640 ه ) . 571. مَعْرِفَة أنواع علم الْحَدِيْث : ابن الصَّلاَح ( ت 643 ه ) . 572. وصل بلاغات الموطأ : ابن الصَّلاَح ( ت 643 ه ) . 573. المختارة : الضياء المقدسي ( ت 643 ه ) . 574. من حَدِيْث المقرئ مِمَّا وافق رِوَايَة أحمد بن حنبل في المسند : الضياء المقدسي ( ت 643 ه ) . 575. ذيل تاريخ بغداد : ابن النجار ( ت 643 ه ) . 576. فضائل بيت المقدس : مُحَمَّد بن عَبْد الواحد المقدسي ( ت 643 ه ) . 577. الأربعون حديثاً : الحسن بن مُحَمَّد البكري ( ت 656 ه ) . 578. المعجم : لابن الأبار ( ت 658 ه ) . 579. مشيخة النعال البغدادي : مُحَمَّد بن الأنجب ( ت 659 ه ) . ( ت 662 ه ) . 581. جامع المسانيد : الخوارزمي ( ت 665 ه ) . 582. جزء لؤلؤ : لؤلؤ بن أحمد بن عبدالله الضرير ( ت 672 ه ) . 583. إرشاد طلاب الحقائق : النووي ( ت 676 ه ) . 584. تحفة الصديق في فضائل الصديق : ابن بلبان ( ت 684 ه ) . 585. مشيخة أبي بكر بن أحمد بن عَبْد الدائم المقدسي الحنبلي ( ت 718 ه ) . 586. الأربعون التيمية : ابن تيمية ( ت 728 ه ) . 587. مشيخة ابن جَمَاعَة ( ت 733 ه ) . تخريج البرزالي ( ت 739ه ) . 588. مشيخة الحَافِظ الذهبي أو (المعجم اللطيف ) . : الذهبي ( ت748 ه ) . 589. الأربعون البلدانية : الذهبي ( ت 748 ه ) . 590. الأربعين في صفات رب العالمين : الذهبي ( ت 748 ه ) . 591. الدينار من حَدِيْث المشايخ الكبار : الذهبي ( ت 748 ه ) . 592. المعجم المختص بالمحدثين : الذهبي ( ت 748 ه ) . 593. تاريخ الإسلام : الذهبي ( ت 748 ه ) . 594. سير أعلام النبلاء : الذهبي ( ت 748 ه ) . 595. تذكرة الحفاظ : الذهبي ( ت 748 ه ) . 596. العلو للعلي الغفار : الذهبي ( ت 748 ه ) . 597. ميزان الاعتدال في نقد الرجال : الذهبي ( ت 748 ه ) . 598. مسند أمة الله مريم الحنبلية ( ت 758 ه ) . 599. بغية الملتمس : أبو سعيد العلائي ( 761 ه ) . 602. مسند الفاروق : ابن كَثِيْر ( ت 774 ه ) . 603. الذيل عَلَى طبقات الحنابلة : ابن رجب ( ت 795 ه ) . 604. المقنع : ابن الملقن ( ت 804 ه ) . 605. أمالي الحَافِظ العراقي ( ت806 ه ) . 606. الأربعون العشارية : العراقي ( ت 806 ه ) . 607. التقييد والإيضاح : للعراقي ( ت 806 ه ) . 608. تقريب الأسانيد وترتيب المسانيد : العراقي ( ت 806 ه ) . 609. بغية الباحث عن زوائد مسند الحارث : الهيتمي ( ت 807 ه ) . 610. المقصد العلي في زوائد أبي يعلى الموصلي : الهيثمي ( ت 807 ه ) . 611. موارد الظمآن : الهيثمي ( ت 807 ه ) . 612. كشف الأستار : الهيثمي ( ت 807 ه ) . 613. مجمع البحرين : الهيثمي ( ت 807 ه ) . 614. إتحاف السادة المهرة بزوائد المسانيد العشرة : البوصيري ( ت 840 ه ) . 615. مجلس في حَدِيْث جابر : ابن ناصر الدين ( ت 842 ه ) . 616. الإتحاف بحديث فصل الإنصاف : ابن ناصر الدين ( ت 842 ه ) . 617. المجلس الأول : ابن ناصر الدين ( ت 842 ه ) . 618. الأمالي المطلقة : ابن حجر العسقلاني ( ت 852 ه ) . 619. الإمتاع : ابن حجر العسقلاني ( ت 852 ه ) . 620. المطالب العالية : ابن حجر العسقلاني ( ت 852 ه ) . 621. تبيين العجب فِيْمَا ورد في فضل رجب : ابن حجر العسقلاني ( ت 852 ه ) . 622. تغليق التعليق : ابن حجر العسقلاني ( ت 852 ه ) . 623. نتائج الأفكار في تخريج أحاديث الأذكار : ابن حجر ( ت 852 ه ) . 624. إتحاف المهرة بالفوائد المبتكرة من أطراف العشرة : ابن حجر العسقلاني ( ت 852 ه ) . 625. عوالي الليث بن سعد : ابن قطلوبغا ( ت 879 ه ) . 626. تدريب الرَّاوِي : السيوطي ( ت 911 ه ) . 627. الأحاديث المئة : مُحَمَّد بن عَلِيّ بن طولون ( ت953 ه ) . 628. اعلام السائلين عَنْ كتب سيد المرسلين : ابن طولون ( ت 953 ه ) . 629. ظفر الأماني في مختصر الجرجاني : اللكنوي ( ت 1304 ه ) . 630. المناهل السلسلة : مُحَمَّد عَبْد الباقي الأيوبي . 631. جزء فِيْهِ نسخة عَبْد العزيز بن المختار البصري . 632. جزء من حَدِيْث عبيد الله بن عمر . 633. أحاديث أبي اليمان الحكم بن نافع وغيره . 642ـ طبقات الحنابلة لابن أبي يعلى. 646ـ الورقة لمحمد بن الجراح. 736- جزء الجركاني الأصبهاني، مطبوع بتحقيق الحنبوط. Letters of the Prophet (s.a.w) to the different rulers of his time , please click here : http://the-finalrevelation.blogspot.in/p/download-islamic-books-softwares.html and go to serial no. 37 . Also see shaykh Muhammad Hameedullah's work 'Al-Wathaiq as-siyasah no. 21 wherein he has extracted from Tabari, Qastalani, Halabi and a host of other sources. which includes various incidents wherein the arabs wrote including the prophet and the quraish. Before the arrival of Prophet (Peace Be Upon Him) to Madeenah, Asa’d Bin Zarara (May Allah Be Pleased With Him) led the people in Jumuah prayer in the suburbs of Madeenah, their number were forty. [Ref: Sunan abee daood:1069,chain hasan; sunan ibne majah:1082, chain hasan; ibne jarood: 291; [ibne khuzaimah: 1724; ibne hibaan:7013. He declared it “saheeh”; imam hakim: 281/1,said it is saheeh on conditions of imam muslim and dhahabi agreed with him]. A narration attributed to Abdullah Ibne Mas`ood (May Allah Be Pleased With Him). أول من قدم من المهاجرين المدينة مصعب بن عمير، وهو أول من جمع بها يوم جمعهم، قبل أن يقدم رسول الله صلي الله وسلم فصلى بهم. The generation after the Sahaabas ,i.e the successors (Taaba'een) have written and taught many more ahadeeth in the form of books, sermons and scrolls. This was further developed and enhanced more extensively in the next generation but In sha Allah their details will be blogged some other time for they are "HUGE" to collect and compile . Thus there are MANY different types of books, scrolls, small pamphlet like manuscripts and etc which cannot be covered in this small article.